Musashi2(Msi2)-Numb pathway de-regulation is a molecular mechanism underlying the transition of chronic phase Ph + CML to deadly blast crisis, particularly in cases with a NUP98/HOXA9 fusion from a t(7;11)(p15;p15). This study provides new insights on the mechanisms cooperating in driving MSI2 over-expression and progression of Ph-positive CML. Herein we describe a t(7;11)(p15;p15) originating a NUP98 fusion with HOXA13, at 7p15, in a 39 year-old man in blast crisis of Ph-positive CML. Both MSI2 and HOXA9 were evaluated by quantitative RT-PCR in our patient and in a series of haematological malignancies. Up-regulation of both genes emerged only in the presence of NUP98/HOXA13 gene fusion. However, over-expression of MSI2, but not HOXA9, was found in 2 cases of Ph + blast crisis with additional chromosome aberrations other than t(7;11). To determine the mechanisms underlying MSI2 over-expression in our patient we performed Chromatin Immunoprecipitation and found that NUP98/HOXA13 fusion protein deregulates MSI2 gene by binding its promoter. To the best of our knowledge, this is the first molecular characterization of NUP98/HOXA13 fusion in blast crisis of Ph + CML. Our findings suggest cooperative mechanisms of MSI2 over-expression driven by HOXA proteins and strongly supports MSI2 as a prognostic marker and a candidate in target treatment of CML. MSI2 gene (17q22) is a member of the Musashi (Msi) family, which is well conserved during mammals evolution and distributed in the stem cell compartment of neural , hematopoietic , pancreatic  and epithelial tissues [4, 5]. 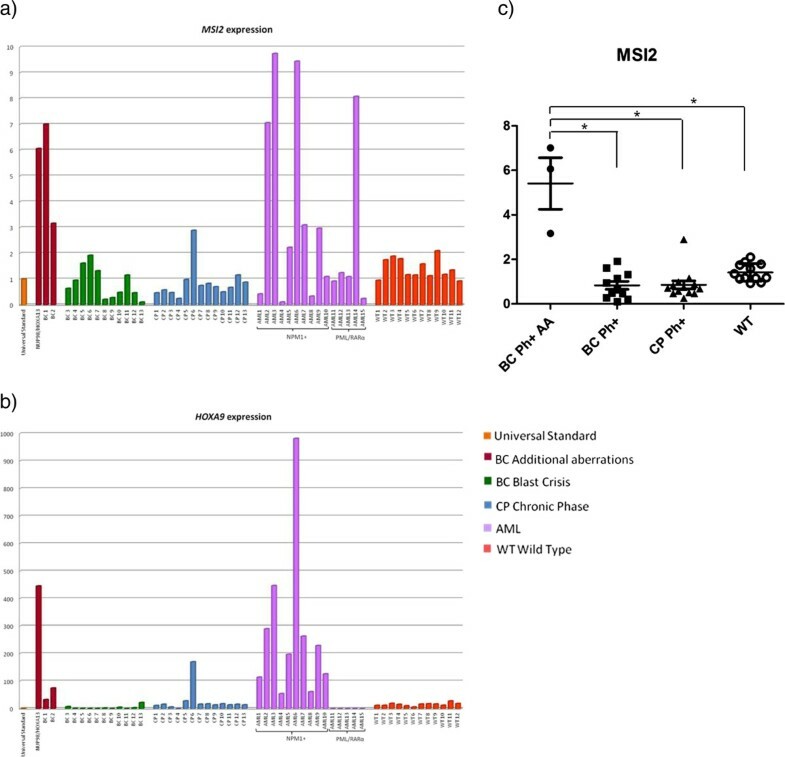 Two translocations involving MSI2 gene at 17q22 have been described in myeloid malignancies [6, 7] and more than 50 point mutations have been reported in solid tumors and cell lines (COSMIC database , cBioPortal for Cancer Genomics ) . Msi2 expression is activated by cooperation between HoxA9 and Meis1 in Meis1-immortalized hematopoietic progenitors . In chronic myeloid leukemia (CML) Ito et al. showed the Nup98/HoxA9 fusion contributed to blast crisis through HoxA9 homeodomain binding to the Msi2 promoter resulting in gene over-expression, down-regulation of the Notch1 inhibitor Numb, and loss of the proliferation/differentiation equilibrium in hematopoietic stem cells (HSCs) . De-regulation of the Musashi-Numb-Notch1 signaling axis is associated with poor prognosis in CML , acute myeloid leukemia (AML)  and B-cell acute lymphoblastic leukemia (B-ALL) . In addition to HOXA9, two genes of the HOXA cluster at 7p15, i.e., HOXA11 and HOXA13, rearrange with NUP98 in leukemia. All fusion transcripts contain the NUP98 N-terminal, with the FG/GLFG domains, that mediate both RNA and protein transport, and the HOX homeodomain, with its DNA binding ability . Thus all these chimeric proteins exhibit their oncogenic potential via transcriptional activation of downstream genes . Remarkably a single t(7;11)(p15;p15) can produce more than one NUP98/HOXA fusion . We investigated MSI2 regulation in the first case of Ph-positive CML in blast crisis with t(7;11) and NUP98/HOXA13 fusion gene. A 39 year-old man was referred to our department because of leukocytosis, mild anemia, and thrombocytopenia (WBC 180000/mmc, Hb 11.8 g/dl, PLT 130000/mmc) associated with splenomegaly. Chronic Myeloid Leukemia in Blast Crisis was diagnosed on peripheral blood and bone marrow smears. Karyotype was 46,XY,t(9;22)(q34;q11)/46,XY,t(9;22)(q34;q11),t(7;11)(p15;p15) . Hydroxyurea therapy followed by Dasatinib 140 mg/day (40 days), were unsuccessful. The patient did not respond to high-dose ARA-C (3 g/m2/day, on days 1-3-5-7) and Daunorubicin (50 mg/m2/day on days 1-3-5). Rescue chemotherapy with Clofarabine (40 mg/m2/day on days 1–5) and Gemtuzumab-Ozogamicin (3 mg/m2/day on day 6) induced prolonged aplasia. Four months after diagnosis the patient underwent unsuccessful bone marrow transplantation from a HLA haploidentical brother. The t(7;11) at diagnosis was investigated by FISH with RP11-348A20 (green) and CTD-3234 F16 (red) for NUP98 gene, RP1-170O19 (centromeric, green) and RP1-167 F23 (telomeric, red) for the HOXA cluster at 7p15. MSI2 gene (17q22) was studied with genomic clones RP11-166P13, RP11-226 M10, RP11-118E18 and RP11-13H16, oriented from centromere to telomere. Analysis was performed with fluorescence microscopy (Provis, Olympus, Italy) equipped with a cooled CCD camera (Sensys-Photometrics, Tucson AZ, USA) and a SmartCapture software (Vysis, Stuttgart, Germany). Metaphase FISH (Figure 1a) showed a NUP98/HOXA gene rearrangement and Interphase FISH (data not shown) identified the fusion in 57% of nuclei. Molecular and cytogenetic studies. a) Metaphase FISH showed a rearrangement between NUP98 gene at 11p15 and the HOXA cluster at 7p15. b) Breakpoint falls between NUP98 exon 16 and HOXA13 exon 2. Red triangles indicate in-frame splicing variants; yellow triangle an out-of-frame variant. Sequence analysis confirmed the transcript. c) The fusion protein with NUP98 GLFG repeats and the HOXA13 homeodomain (HD). NUP98_1083F 5’-ggtaataccagcaccataggacag-3’ and HOXA9_1036R 5’-tgtggcctgaggtttagagc-3’ or HOXA9_736R 5’-cagttccagggtctggtgtt-3’ for the first amplification round; NUP98_1252F 5’-cttactacatttggaagcac-3’ and HOXA9_736R or HOXA9_708R 5’-gggcaccgctttttccgagt-3’ for the second (NUP98: NM_00139131.3, HOXA9: NM_001164603.1). NUP98_1083F and HOXA11_837R 5’-ctctcggatctggtacttggt-3’ for the first amplification round and NUP98_1252F or HOXA11_837R for the semi-nested PCR (HOXA11: NM_ 005523.5). NUP98_1083F and HOXA13_992R 5’-cctcctataggagctggcat-3’ for the first amplification round and NUP98_1252F or NUP98_1400F 5’-acctgggactcttggaactg-3’ and HOXA13_992R for semi-nested PCRs (HOXA13: NM_000522.4). PCR products were sub-cloned into the pGEM-Teasy vector (Promega, Madison, WI) and sequenced by Sanger’s method (ABI 3500 Genetic Analyzer, Applyed Biosystems, Foster City, CA). Molecular analysis revealed an in-frame fusion transcript. NUP98/HOXA13 had 3885 bp and a breakpoint between exon 16 (nt 2322) of NUP98 (NM_00139131.3) and exon 2 (nt 952) of HOXA13 gene (NM_000522.4). Three splicing variants had the same breakpoint but were lacking respectively NUP98 exon 11, 12 or 14 (which was out of frame) (Figure 1b and c). Since in silico analysis showed HOXA13 and HOXA9 homeodomains were very similar (75,4% of similarity; 57,9% of identity, score: 274; analysis performed with EMBOSS Matcher program 6.6.0 http://www.ebi.ac.uk/Tools/psa/emboss_matcher/, matrix: BLOSUM80, gap penality: 14, extended penality: 4), we hypothesized NUP98/HOXA13 could bind MSI2 promoter and tested whether HOXA9 was involved in the present patient. qRT-PCR (LightCycler480, Roche Diagnostics, Germany) was performed using TaqMan assay probes (Applied Biosystems, Foster City, CA) Hs00292670_m for MSI2 gene, Hs00365956_m1 for HOXA9 and Hs00426284_m1 for HOXA13. Our CML in blast crisis was compared with 41 cases of diverse haematological malignancies (13 blast crisis CML, 13 chronic phase CML, 10 NPM1c+ AML which over-express MSI2[14, 20] and 5 Acute Promyelocytic Leukaemia) as well as 12 cases of non-malignant diseases (wt). Reaction mixtures, of 25 μl each, contained 12.5 μl of TaqMan Universal PCR Master Mix (Applied Biosystems), 1.25 μl of the TaqMan assay probe and 5 μl of cDNA (1/10 of RT product). Protocol consisted of 2 minutes at 50°C for activation of AmpliTaq Gold and 10 minutes at 95°C for DNA denaturation. Amplification was performed with 45 cycles of 15 s at 95°C and 1 min at 61°C. All samples were tested in triplicate. Amplification of the sequence of interest was normalized to the average of two endogenous reference controls, GUSB (Hs00939627_m1) and B2M (Hs00984230_m1) , and compared to the expression of a Universal Human Reference RNA (Stratagene, Cedar Creek, TX, USA). Fluorescence data were analyzed with the software version 1.5 and Second Derivative Maximum method; gene expression was expressed as Cp (Crossing point) values. Statistic significance for MSI2 expression was tested by Mann–Whitney test (*p < 0.05/3). In the present case both MSI2 and HOXA9 were over-expressed (Figure 2a, b and c). Notably this over-expression emerged also using the two reference genes singularly [see Additional file 1]. No wild-type HOXA13 was found (data not shown). MSI2, but not HOXA9, was significantly over-expressed also in two other cases of Ph + blast crisis CML both harbouring additional cytogenetic aberrations (BC1 and BC2 in Figure 2a and b), with the following karyotypes: 46,XY,t(9;22)(q34;q11) /49-52,XY,idem,+8,+t(9;22)(q34;q11),+13,+15,+21[cp6] (patient BC1), and 46XY,t(3;7)(p21;q32),t(9;22)(q34;q11)[15/15]) (patient BC2). Notably in these cases FISH excluded involvement of NUP98, the HOXA cluster and MSI2 gene. Expression analysis. a) MSI2 and b) HOXA9 are over-expressed in the present patient with NUP98/HOXA13. BC1 and BC2: two other cases of Ph + blast crisis CML with additional karyotypic aberrations over-expressing MSI2 but not HOXA9. Expression values were referred to the average of two references. Fluorescence data were analyzed with the Second Derivative Maximum method; gene expression was expressed as Cp (Crossing point) values. c) Significance for MSI2 expression was tested by Mann–Whitney test (*p < 0.05/3); values are expressed as means +/− SD; AA. Additional aberrations. Human MSI2 and HOXA9 genomic promoters were deduced using information provided by Web Promoter Scan Service . ChIP assays (EZ-ChIP, Millipore-Upstate, MA, USA) were performed on 2x107 cryopreserved bone marrow cells after cross-linking (1% formaldehyde), lysis (SDS lysis buffer plus protease inhibitors) and sonication. 2×106 cells were pre-cleared and 1% kept as “input”. Anti-NUP98 [2H10] (ab50610 Abcam) was used to recover protein-DNA complexes. 3 μl of immunoprecipitated DNA were amplified by semi-quantitative PCR with primers for the hypothetical HOXA13 binding sites: MSI2_-842 F (5’-GTGTTTGTGCAGGAGGGTCT-3’)/MSI2_-615R (5’-CCCTCTCTAGTTCGCCCTCT-3’) and HOXA9_-1071 F (5’-TAGCAAAGGCGAATTTAAGGG-3’)/HOXA9_-907R (5’- AGTCAAATTCAACGCAGGATC-3’). The exponential amplification conditions were controlled to obtain data in a linear range of amplification. Data were confirmed by qPCR using Brilliant II SYBR Green qPCR Master Mix (Agilent Technologies, USA) and LightCycler480 (Roche Diagnostics, Germany). The crossing point (Cp) determined the quantity of immunoprecipitated DNA . 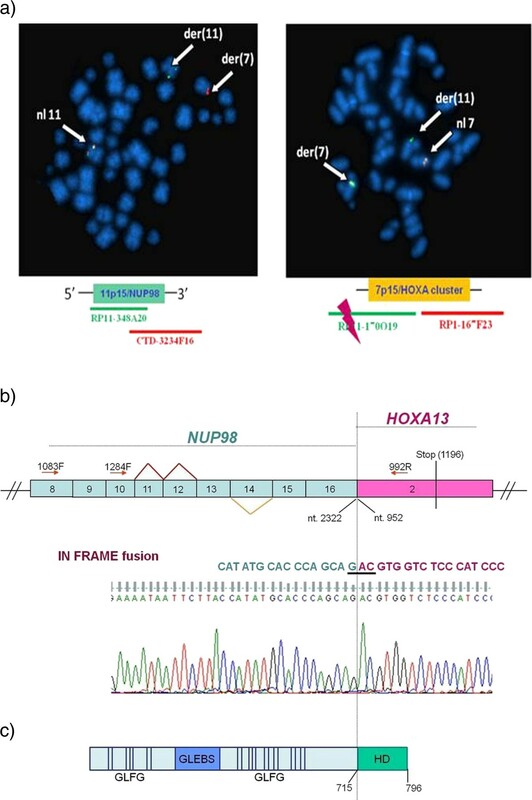 ChIP confirmed the binding of NUP98/HOXA13, but not of wild-type NUP98, to both MSI2 and HOXA9 promoters in the present patient (Figure 3a and b). Chromatin Immunoprecipitation. NUP98/HOXA13 binds both MSI2 and HOXA9 promoters. ChIP was performed on both NUP98/HOXA13 sample and a non-malignant disease sample (wt). 1,5 μg of rat IgG (Millipore Normal Rat IgG Polyclonal Antibody) and No Antibody (not shown) were used as negative controls. a) Semi-quantitative PCR showed an enrichment in NUP98/HOXA13 sample compared to controls. b) qPCR confirmed this result; data are presented as fold increase relative to the control sample (wt) based on the formula 2−ΔΔC p. One out of three (for MSI2) or two (for HOXA9) ChIP experiments is shown. The results shown are the mean ± S.E.M. (error bars) of two independent qPCR experiments. c) NUP98/HOXA13 binds both MSI2 and HOXA9 promoters. HOXA9 binds MSI2 promoter. Protein structure: homeodomain (HD). Gene structure: exons (numbered boxes), transcription start site (TSS; +1), direction of transcription (flag), putative HOX binding element 1 kb upstream of TSS (oval). This study was important to enrich our knowledge on molecular events underlying the t(7;11)(p15;p15) in the blastic crisis of Ph + CML. For the first time NUP98/HOXA13 has been identified in CML, although it was reported in one case of AML  and one case of MDS . The pathogenetic role of NUP98/HOXA13 rearrangement in the evolution in this case is emphasized by the absence of transcript isoforms from alternative splicing, such as NUP98/HOXA11 and all NUP98/HOXA9, as previously reported . As we excluded the presence of the wild type HOXA13 transcript, MSI2 and HOXA9 were over-expressed in malignant cells (Figure 2a, b and c) as a consequence of NUP98/HOXA13 fusion. Notably, HOXA13, fused to NUP98, up-regulated MSI2 both directly by binding to its promoter and indirectly by binding to the HOXA9 promoter, thus inducing a synergistic effect between the two HOXA proteins (Figure 3c). 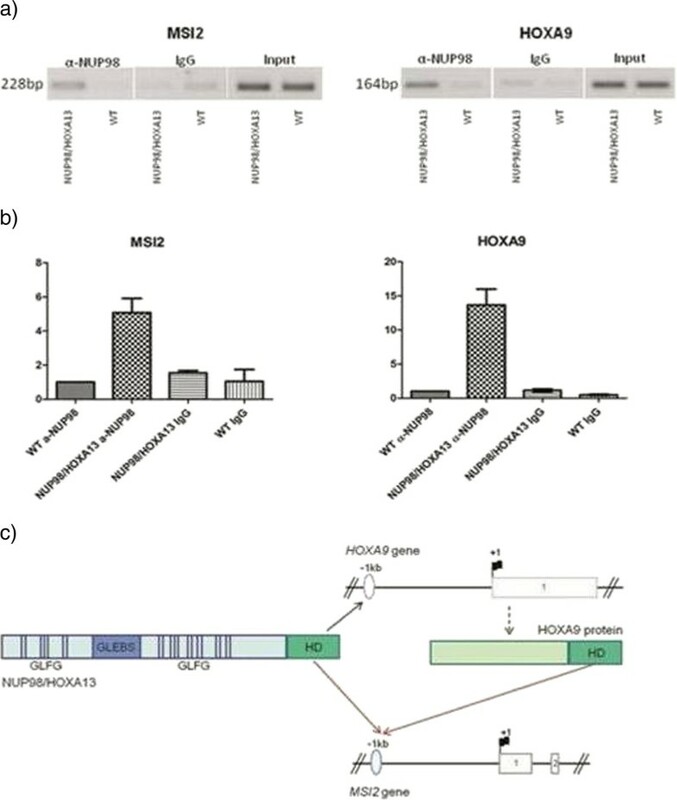 Over-expression of MSI2, but not HOXA9, emerged in two other cases of Ph + blast crisis (BC1 and BC2, Figure 2a and b) with additional cytogenetic rearrangements suggesting that, in addition to HOXA9 and HOXA13, alternative mechanisms may deregulate MSI2 in the presence of clonal evolution and acute phase progression of Ph + CML. In conclusion this study provided new insights on the molecular heterogeneity of t(7;11)(p15;p15) in the blastic crisis of Ph + CML. Our report suggests that HOXA13 can bind to the promoter of MSI2 and may contribute to its activation in a patient that harbors NUP98/HOXA13 fusion. Ethical approval has been obtained for the protocol “In-depth genomic characterization of leukemia to provide new tools for personalized diagnosis and disease monitoring” ( AIRC 2011–2014) from the University Bioethics Committee of the University of Perugia (Prot. 1.X.2011). We thank Dr. Cinzia Allegrucci, University of Nottingham, for a critical review of data and Dr. Enrico Gottardi, University of Turin, for kindly providing some samples. This work was funded by Associazione Italiana per la Ricerca sul Cancro (AIRC IG-11512), PRIN 2010–2011, Associazione Damiano per l’Ematologia (to DDG). Mutation data were obtained from the Sanger Institute Catalogue Of Somatic Mutations In Cancer web site, http://www.sanger.ac.uk/cosmic. DDG designed and performed the research, analyzed the data and wrote the paper, VP performed FISH experiments, GB contributed to data analysis, VC and AV contributed to ChIP experiments and analysis, CM supervised the study and reviewed the manuscript. All authors approved the final manuscript.